Quantitative Easing: The creation of fiat money (money whose use is enforced and competition with is prevented by the government‘s police power) in order to purchase assets from a group holding or creating those assets, allowing their sale at a premium price over individuals’ voluntary preference on the market, and granting access to newly created money and its spending before others get their hands on it, thus transferring wealth to those receiving it earlier/earliest (banks and government) from those receiving it later/latest (wage earners) who pay for it in the form of prices that are higher than they would have been, had QE not occurred. In this particular case the asset being offered is of course government debt, that is, a piece of paper issued by a group with lots of guns, that promises the person buying it future income at interest, funded from money that will be taken from other people at the threat of imprisonment or asset seizure (which is where the guns can be helpful at times). “Quantitative Easing” is in that sense a pretty descriptive term since it makes it “easier” for the government to pillage the public to the tune of large “quantities” over time. In the current environment it shall be duly noted that QE2 may actually be not very different from QE1 in that all that happens is that bank reserves are created at the Fed in exchange for government debt previously held by banks which will boost Treasury holdings at the Fed to more profitable levels, while the banks will be sitting on more excess reserves without any additional lending activity resulting from it, simple because the entire economy is sick and tired of debt! Forcing government debt onto people is not really a new policy but rather a project that has been ongoing in the US at least since the establishment of the Federal Reserve Bank, with occasional boosts such as this one. The objective being of course to make the issuance of debt as easy and cheap as possible for the bureaucrats in power by keeping the interest to be paid lower than the market rates for as long as possible, until the interest payments on the public debt inevitably start eating up all other potential expenses at a point when it will be way to late to do anything about it. Some people might wonder why bureaucrats seem to not give a damn about deficits ( it’s shocking news I know ;) ), well here’s one of the reasons: when you subsidize something, you’ll get more of it … pretty much inevitable, especially if those who incur the debt will never be held liable or accountable when it comes to paying it back. 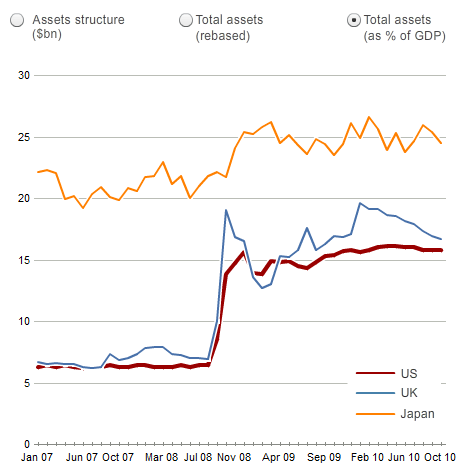 Currently the holdings of assets at the central bank in the US are at around 16% of GDP. This new round of QE will probably add another 4% ($600 billion) until the middle of next year. (The obvious fact that people are sick and tired of debt and that the entire exercise will not in any way spur lending or borrowing activity in the long run (probably not even in the short run), except for within government, need not concern those in power since that is not their objective anyway. Nor does it matter whether or not it creates inflation or whether we should fear a deflation, were QE to not occur. None of these questions address the root of the matter. And finally, when the Fed then acts surprised that that approach also hasn’t helped reduce unemployment or affect any other positive change in any way, it will make chief clown Paul Krugman (whose subtle analysis is of course “not enough, duuude”) happy and introduce QE3, QE4, and so on and so forth, making sure that there will be no meaningful recovery whatsoever. In short: QE 2 is just another small piece in that puzzle called “more of the same”.